This special post is warmly dedicated to all Filipinos overseas who are far away from home to celebrate Christmas together with their families. And because of great distance, they continue to endure their loneliness and longing only to make things way better back home. While most people around the world think of Christmas in terms of the colors red and green, Filipinos though, view Christmas in terms of lilac and yellow as it heralds the season of the Puto Bumbong and the Bibingka. Puto Bumbong is one of the most sought after delicacies at Christmas time. After the Misa de Gallo or the early dawn mass on the nine days before Christmas usually from December 16 to Christmas Eve, people would line up to the stalls right outside the Catholic church just to have a quick taste of this all-time favorite Filipino delicacy. 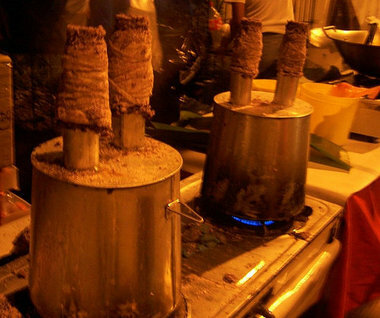 It is so popular among locals and foreign tourists alike that even five-star hotels and gourmet restaurants serve them during the holiday season using the traditional Lansungan - a special steamer (photo above) usually made of tin or aluminum, mounted on a pot of boiling water with two to three protruding tubes holding the Bumbong or bamboo tubes filled with the needed ingredients and steamed through until cooked. The Bumbong is wrapped around with muslin or cheese cloth primarily to protect the hands from the heat generated by the steam when Puto Bumbong is cooked and ready to be removed from the steamer. Puto Bumbong is an all-time traditional Filipino delicacy made of glutinous rice cooked in bamboo tube in which it is steamed. 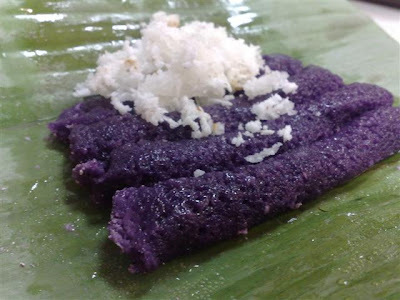 It is elongated and quite thin in shape which results from the method it is cooked, and its distinct color is purple due to the mixture of sweet rice and black rice called Pirurutong in which it is made of. It is best served topped with a thin spread of butter or margarine, freshly grated coconut to give it texture and cuts the stickiness of the roll, and sprinkled with just a bit of Muscovado or brown sugar to give it a hint of nutty sweetness that refined sugar does not have, and then served on wilted banana leaves which will keep it warm and moist until ready to be eaten. While cooking Puto Bumbong is fairly quick and easy, preparation is usually a three-day process. On the first day, a mixture of equal amount of sweet rice and Pirurutong is soaked in salted water overnight. Traditionally, a grinding stone of some kind is used to grind the rice mixture but nowadays, a blender is commonly used. Either way, the grounded rice mixture is then placed and hanged in a cotton sack for another day in order to drain excess water. On the second day, the rice mixture is grounded in a blender and then placed and hanged in a cotton sack for another day in order to drain excess water. The rice mixture should be ready the next day, and it should be moist, not dry. The next step is to mix it up by hands to break up any clumps. The bamboo is then filled up with the rice mixture and placed on top of the Lansungan over a pot of boiling water. Puto Bumbong is done when the rice mixture turns dark purple and sort of shrinks inside the bamboo. Vendors selling a variety of Christmas delights outside the church after the traditional Misa de Gallo.